HAGATNA, Guam (AP) — Atop a lofty hill overlooking the ocean in the U.S. territory of Guam, a residence for the governor and a ceremonial one for the archbishop sit together, a decades-old symbol of their seemingly equal power on an island where nearly everyone is Roman Catholic. Catholicism is woven deeply into the Spanish-influenced culture of this land of 165,000 people. Families consider it a blessing to be closely associated with priests, and having a son grow up to be a priest or a daughter become a nun is a source of pride. That’s why allegations that the island’s archbishop molested altar boys decades ago have divided churchgoers and put the governor in a difficult spot politically. 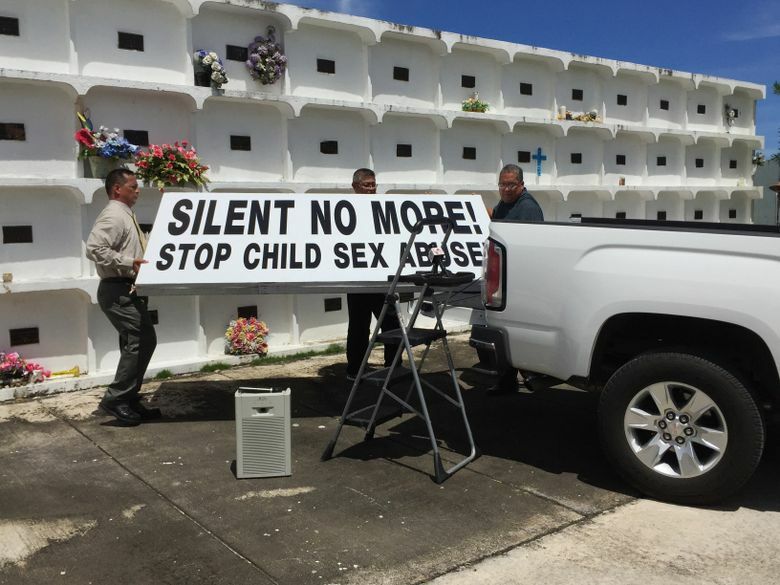 When the Legislature unanimously sent him a bill eliminating the two-year statute of limitations for suing over sexual abuse, priests worked feverishly to stave it off, telling parishioners at Sunday Mass at the island’s 26 churches that the measure would bankrupt the church. Gov. Eddie Calvo, a Catholic, had to think hard about what to do. In the end, despite petitions bearing thousands of signatures, Calvo signed it into law last month, opening the church up to potentially millions in liability. “I am saddened that even a single injustice had to happen in order to make this law necessary. There are no winners. Justice is the only victory,” he said. Archbishop Anthony Apuron, 70, has vigorously denied allegations he molested at least five altar boys in the 1960s and 1970s. The allegations got little attention when they first came to light in 2014 but resurfaced this summer after a deacon accused Apuron of keeping the archdiocese’s sexual abuse policy weak to protect himself. 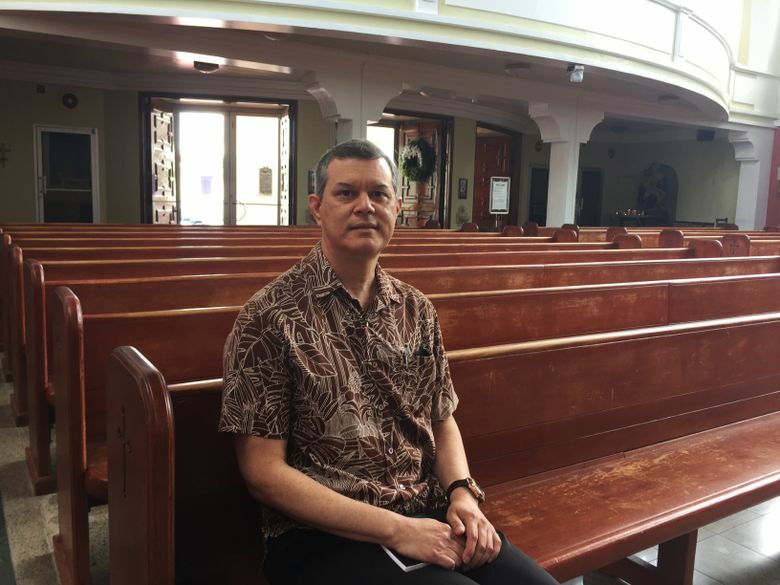 One of the alleged victims, Roy Taitague Quintanilla, 52, of Hawaii, said he was 12 when Apuron, then a parish priest, touched him inappropriately after persuading him to spend the night at his house. “I cried then, and I’ve never stopped crying,” he said at a news conference in May. The Associated Press does not usually identify alleged victims of sexual abuse, but Quintanilla has spoken publicly. Apuron has not been charged. His lawyer did not return repeated messages seeking comment. In June, Pope Francis named a new leader to run the archdiocese until a new archbishop is named. 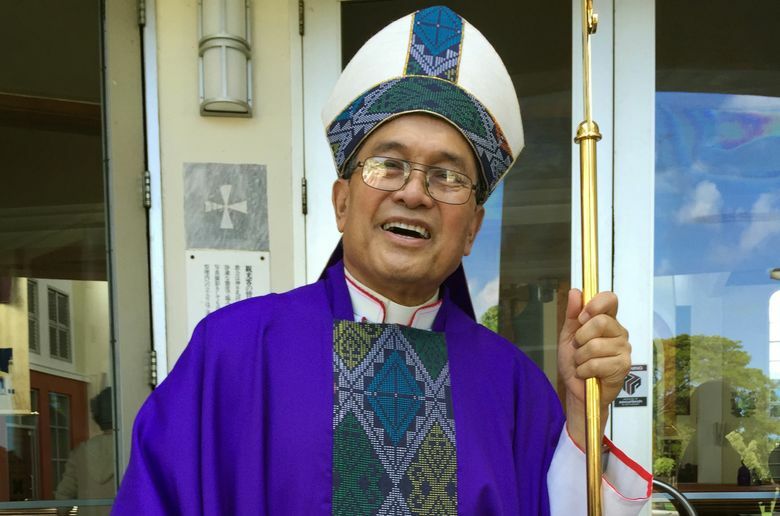 That interim leader, Archbishop Savio Hon Tai Fai, told the Guam faithful that a church trial for Apuron will be held, a conciliatory effort that was seen by some as a way to kill the statute-of-limitations bill. Guam, some 3,800 miles west of Hawaii, is far removed from the hierarchy of the Catholic Church. 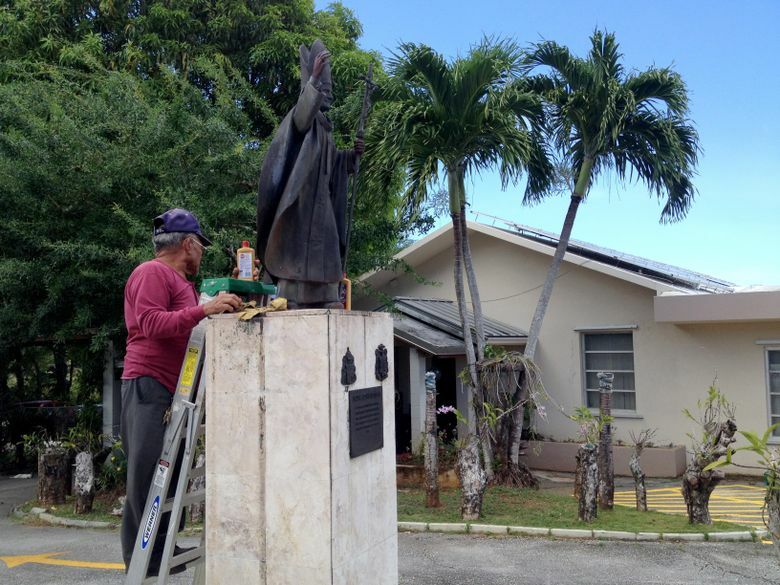 The history of the church on the island stretches back to the 1600s, when Guam’s native Chamorros were converted to Catholicism by Spanish missionaries. Chamorros who resisted killed a Jesuit missionary and his Filipino altar boy. Their martyrdom fueled Catholicism on the island for the next 350 years. The island was ceded to the U.S. after the 1898 Spanish-American War and was occupied by Japanese forces during World War II until being liberated in 1944. It remains an important outpost in the western Pacific for the U.S. military. Some speculate Apuron’s alleged acts have long been known but went unreported because of loyalty to the church. 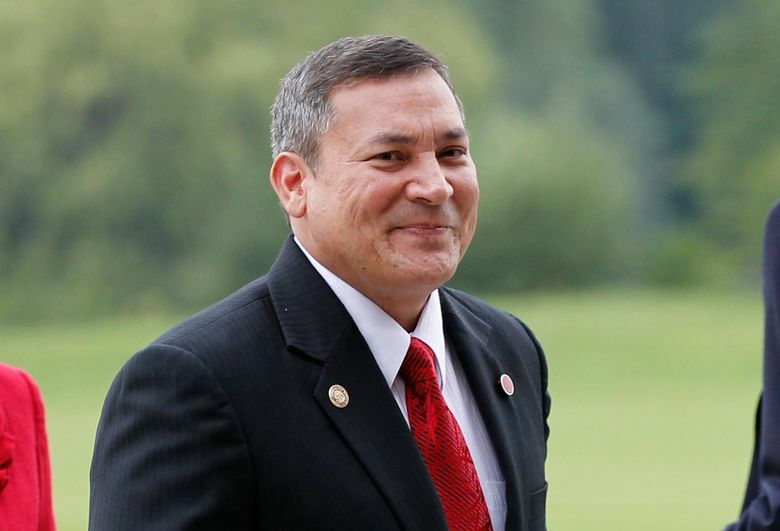 Apuron lobbied heavily against a 2011 bill that became law that suspended the statute of limitations for sexual abuse lawsuits for two years. The archbishop succeeded in getting lawmakers to rewrite the bill so that it did not apply to legal actions against the church. “They were getting calls on the floor by the archbishop himself. I could hear the archbishop’s voice talking to them,” said the Legislature’s vice speaker, Benjamin J. Cruz, who says he was sexually abused as a child by a priest in Los Angeles. But that deference toward the church may be weakening. The Legislature and governor didn’t buckle this time under the church’s pressure. That such a bill even got traction could be considered a fundamental change. Some parishioners still support the church. Melinda Burke, 63, an active lay member and a victim of child sexual abuse, said the turmoil hasn’t shaken her faith. “Priests and lay people are sinners. Only God is holy. God is our rock, not his imperfect church,” she said. Some say the weekly Sunday protests in front of the cathedral are disrespectful. But some say it is about time the church takes responsibility for what happened, even if it means financial ruin.